My husband said he really likes this ring. They're both about a quarter size too big still, but we'll live with it. 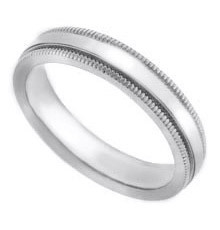 This palladium men's wedding band has a stylish design. The 4mm flat band is finished with a milgrain design on each edge. This traditional ring is a popular choice for the groom.